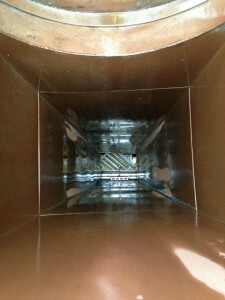 Kitchen exhaust hood cleaning Long Beach CA may seem simple enough. Basically, it just involves scraping the greasy residue left by cooking off of the inside of your exhaust hood. However, this doesn’t mean that you should trust just anyone to perform your kitchen exhaust hood cleaning. You need the help of pros like Flue Steam if you want to get a truly thorough cleaning. Because we offer other services like grease filter exchange service, steam cleaning, and exhaust fan repairs, we can quickly and easily address any other issues we may discover during your routine exhaust hood cleaning. Do You Need Kitchen Exhaust Hood Cleaning Long Beach CA? Managing grease buildup in your kitchen exhaust system can be tricky. You want to keep the buildup from exceeding safe levels, but at the same time you don’t want to pay for unnecessarily frequent service. Hand-scraping is very a very effective and economical way of getting your kitchen exhaust hood cleaning Long Beach CA done. We can check the grease levels before and after we work, which will help us adjust the frequency of your cleanings to provide the best value. Ideally, we will be performing the cleaning right before the grease buildup in your hood reaches the danger mark of 0.125”, and reducing that buildup down to the desired level of 0.002”.